As our houseplants are thriving, so too are fungus gnats! More often than not, these are the little black gnats that are flying around in your home, hanging out next to your windows, doors, computers, kitchen, or anywhere houseplants are kept. Even though these gnats can be a big nuisance and are often hard to capture in mid air, there are several treatments that work really well for them! Diagnosis: Fungus gnats are small, wispy, black flies that are found indoors any time of the year. Adults measure about 1/8″ long and have delicate legs and antennae. Despite being a nuisance, they are harmless in the adult stage. Adults breed and lay their larvae in the moist soil of houseplants, so if you have indoor plants you will be more susceptible to them. Fungus gnats typically fly in short erratic patterns, almost like they are bouncing around in the air. At this time of the year, fungus gnats are often confused with fruit flies, who have a thicker body and are attracted to fermenting fruit or moist decaying organic matter. For more information on fruit flies, please view our Blog article from last year. Treatment: Fungus gnats have a life cycle that lasts about 3-4 weeks. Flying adults live for about 10 days, but a female can lay up to 200 eggs in that short time. For this reason, it is critical to take some steps to eliminate them before becoming a larger problem. The best areas to treat are your houseplants or nearby windows. If you don’t have any houseplants, then maybe plants close to your doors outside are the culprit. Because fungus gnat larvae like to live in the top 2 inches of soil, it is best to limit watering to only what is necessary and allowing your pots to dry out in between waterings. This can kill larvae and make it less appealing for adults to breed. Modified watering habits are sometimes all that is necessary for effective control, but we typically recommend either stick traps or an insect killer be used in conjunction. Safer Brand’s sticky traps are a great solution for capturing adults. They simply push into the soil of your potted plants and lure gnats because of their yellow color. By capturing the adults you are effectively ending the life-cycle of the gnats. You might also want to consider an insect killer or two. Pyrethroid-based sprays work great again adults, but if you want to kill the larvae in soils then you are best off with a granule-based product with imidacloprid, such as Bonide’s systemic Houseplant insect granules. Repeated applications of either of these insect killers will help out greatly. If you were to choose only one insect killer, you would be best served using the imidacloprid and focusing on the control of the larvae since it is harder to predict the whereabouts of adult gnats. Prevention: Consider treating the soil of outdoor plants (or re-potting them entirely) anytime you are bring them indoors. 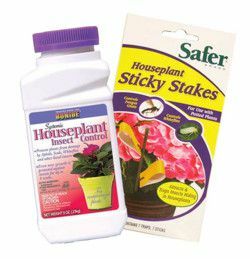 Actually, re-potting plants in general is a good idea, because older potting mixes are more attractive to fungus gnats. Also, only water houseplants as much as necessary and try to eliminate periods of prolonged moist soil. As we mentioned above, it is best to allow houseplant soil to dry out partially in between watering.